A hundred years ago the only material available to James Miller, the original designer of Stirling Station, to create his ‘extravaganza’ was glass. Today, six millimetre thick sheets of Makrolon® lightweight, non-fragile, self cleaning polycarbonate provide a superior glazing material which, when used with the Twinfix glazing system, can be quickly installed to provide a more robust glazing. 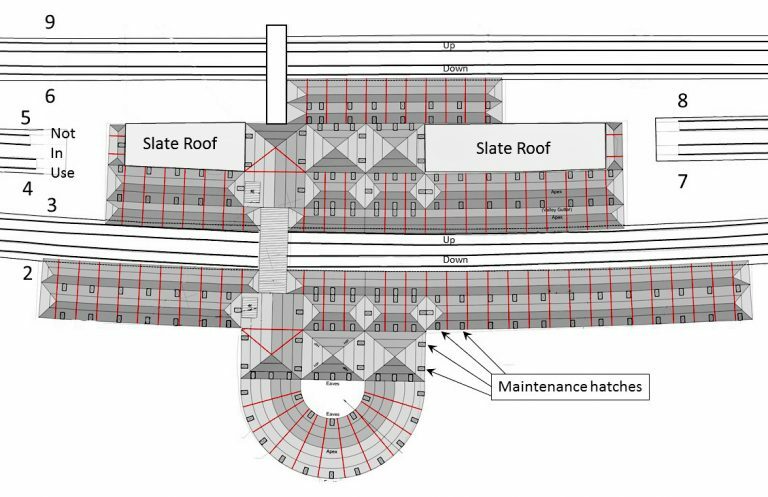 The need for this was clear as an estimated one in six of the glass roof panels had been cracked as a result of vibration from freight trains and there were concerns that a damaged panel might fall onto one of the platforms below. Although the Makrolon sheets used were a Georgian-wired cast-effect polycarbonate, Stirling City Council’s planners were not convinced. Hence it took two years for Network Rail to obtain planning permission to reglaze the Category A-listed Stirling station. One concern was that polycarbonate would discolour over time and so would undermine the “architectural integrity” of the station. This was addressed by tests that demonstrated polycarbonate would not discolour in the short term and an agreement for ten-yearly inspections, following which any discoloured panes would be replaced. The planners were also not prepared to accept the use of Twinfix standard 63mm glazing bars as the existing station bars were 50mm wide. To address this issue, Twinfix designed a new glazing bar and produced a ‘mock up’ using a 3D printer. This was shown to the planners, to convince them that this was acceptable, and was also used to confirm the dimensional tolerances of a glazing system incorporating the new 50mm bar. Once planning permission had been received, Story Contracting was able to start the roof works last August. These included, in addition to re-glazing the 2,440 square metre roof, inspection, repairs and painting of the supporting structure as well as relining cast iron gutters and cleaning downpipes, all at a total cost of £2.5 million. The design and execution of this work was part of the station framework contract which Network Rail Scotland had awarded to Story in 2014. Story’s designer was Arup, which was primarily concerned with the connection between the steelwork and the glazing system. As the polycarbonate sheets are much lighter than glass, particular consideration had to be given to wind uplift. The glazing system, designed by Twinfix, was quick to install as each panel interlocks to the adjacent one. A recent innovation is the roof access hatches These form an integral part of the glazing system and had been developed by Twinfix in response to a request from Network Rail that maintenance could be undertaken without the need to gain access above the glazing. At Stirling, 174 such hatches were installed at 4.2 metre centres from which gutter cleaning and other work can be carried out using six-foot-long omnipoles. Story’s rail director for Scotland, John MacArthur, considers that Stirling’s historic station is not only a high profile project, but also one that presented some interesting challenges. It had originally been thought that the cast iron glazing in the round concourse area would be one of them. However, once the panel sizes were determined, it was found that they were all the same size as the circular glazing was geometrically perfect. In contrast, there is a significant degree of non-uniformity of the supporting steelwork over the slightly curved platforms. This may have been deformed due to wind loading over the past hundred years but, whatever the reason, the result was that a significant number of glazing panels were of a non-standard size. Hence Twinfix had a small installation team on site which cut individual panels to the required dimensions. John estimated that this was necessary for 10 per cent of the panels. The original steelwork was generally in good condition and only required occasional localised repairs before painting. John felt it had been well maintained, perhaps as a result of Stirling being a relatively small and high-profile station. The paint used was a three-coat M24 epoxy protective system applied over the existing lead paint which had previously been prepared using power tools. The roofing work was undertaken from a fully enclosed crash deck above the platforms. This was erected during a night station closure using rules of route possessions for work close to the platform edge. In this way, the 46,000 passengers who use the station each week were not affected and there were no platform closures. deck scaffolding hoardings could potentially affect train despatch sightlines. In consultation with ScotRail, this problem was resolved by closing off the area underneath the crash deck with heavy duty netting through which sight lines could be maintained. It was therefore possible to erect a larger area of crash deck than would otherwise have been possible, greatly improving productivity. In this way, most of the work took place both during the dayshift and in a high street environment. However, possessions were required for the re-lining of the gutters using mobile elevating work platforms to work over the dagger boards. 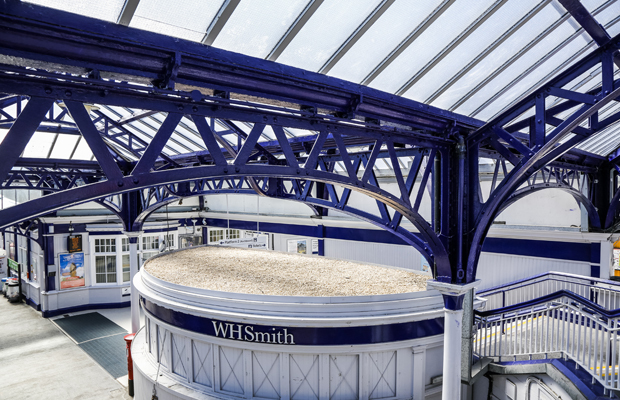 Story completed its Stirling station roof work in June, two months ahead of schedule. John MacArthur considers that the key reason for this early finish was the use of a larger crash deck than was originally planned, the result of good collaboration between Story and ScotRail’s station management team.